Sebastian (“Seb”) Lambang, creator of the SEB Coaxial Rests and the Coaxial Joystick Bipod, has engineered an impressive new wood and aluminum F-Class stock. The stock features a long, box-section aluminum fore-end with a wood rear section and wood-trimmed “wings” on the front bag-rider. The aluminum fore-arm has “buick vents” for weight reduction. From the end of the action rearward, the stock is mostly wood, with light and dark fancy wood laminates on opposite sides (left and right). This is an interesting, innovative stock design. And as with everything Seb produces, the craftsmanship, fit and finish are superb. We may get a chance to see how well this new stock shoots at the F-Class World Championships later this month in Raton, New Mexico. Seb also crafted a handsome set of angled scope rails with beautifully-machined scope rings. Imagine being able to custom-make one-off products of this quality in your own machine shop! Share the post "Wow Factor: Seb’s Wood and Aluminum F-Class Stock"
Our friend Sebastian (“Seb”) Lambang recently released some photos that illustrate the “inner workings” of his advanced SEB NEO Front Rest. If you’ve ever wondered how a joystick front rest works, and how the parts go together, study the photos below. In addition, for those who use a NEO rest in competition, Benchrest Champion Mike Ratigan offers some PRO USER Tips that will help you get the best results from your NEO. Lots of Travel — 43 MOA Vertical and 48 MOA Horizontal via joystick alone. 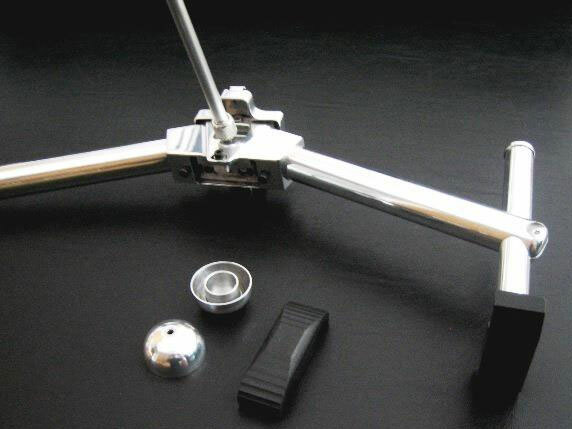 The NEO offers more joystick travel than any other coaxial rest. Rack & Pinion Risers — The NEO has dual support columns with Rack & Pinion system, offering a very broad vertical adjustment range. Optional Counter-Weights — The NEO comes standard with a spring-loaded top mechanism to help hold up the rifle. Optional counter-weights allow you to reduce spring “pre-load”. Many people feel the counter-weights also allow a smoother, less jerky movement. Reversible Base — The NEO’s base can be set-up with either the long leg in the rear or the long leg in the front. Putting the long leg in front gives more room under the rifle. NEO Packs Flat — The SEB NEO is easily dismantled for transport, and can pack nearly flat. This is a big advantage when traveling. 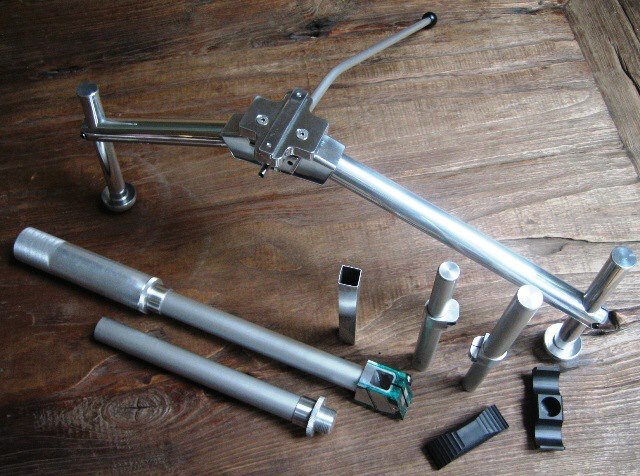 Share the post "SEB NEO Front Rest — Unique Features of This Co-Axial Design"
It was Christmas in April this weekend, as our new GEN II Joystick Bipod system arrived — thanks to Sebastian (Seb) Lambang of SEB Coaxial. We’re anxious to try this sophisticated new system on a variety of rifles, both small-bore and big-bore. Designed for F-TR shooters, we think the new Joystick bipod (aka “Joy-Pod”) may also prove popular with tactical shooters and varmint hunters who need a lightweight, yet easily-adjustable front support. Like his coaxial front rests, Lambang’s Joystick Bipod controls both horizontal (windage) and vertical (elevation) with a single control arm. In addition, the GEN II “Joy-Pod” offers cant adjustment with its tilting head. 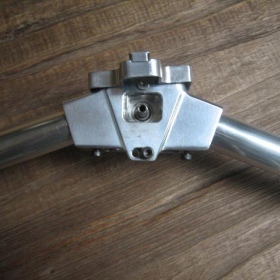 Gross height can be easily adjusted on the vertical legs, both of which feature a column of precision-machined teeth (like on a jack), with a positive quick-adjust locking mechanism. The whole Joy-Pod system weighs about 21 ounces, and SEB even provides a handy nylon storage case. We’ll be field-testing our new Joy-Pod in the near future and we’ll let you know how it works. SEB is not soliciting advance orders just yet — as there may be some final mods on the production version. Price hasn’t been set yet, but it should be competitive with the popular F-TR wide-base bipods on the market. If you’re intrigued, you’ll find many more hi-rez product photos on Seb Lambang’s Facebook Page. Share the post "SEB Spreads the Joy — Gen II Joystick Bipods Arrive in USA"
Seb Lambang of SEB Coaxial has revealed the GEN 2 version of his revolutionary joystick bipod (aka “Joy-Pod”). The latest version is lighter yet more rigid. The GEN 2 design features a longer handle plus built-in cant adjustment. Seb’s first-generation Joy-Pod was tested last year in Great Britain. Laurie Holland has been testing a modified version of the GEN 1 design, and he reports that it is working great. The GEN 2 design incorporates lessons learned with the first prototype. It offers more reach and less weight. 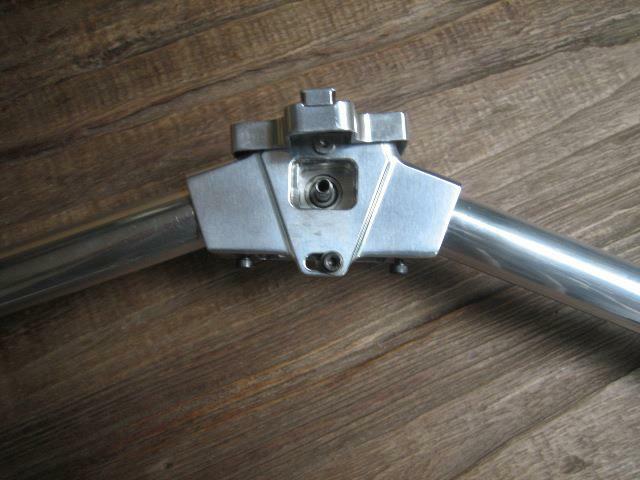 A clamp on each leg allows for easy coarse height adjustment. Importantly, the head unit now allows +/- 14° of cant adjustment. This allows the shooter to fine-tune the cant of his rifle to suit the terrain, or his preferred rifle orientation. Currently cant is adjusted with a screw on the Joy-Pod head unit, but the production version will adjust cant via a handy locking lever. Seb has experimented with a variety of bipod configurations, including an offset design (shown below) with asymmetrical arms. One horizontal arm is longer than the other. This moves the rifle’s mass to one side (so it is not centered between the two feet). The goal of the offset design is to counter torque and rocking when the gun is fired. Will the offset design work? No one really knows yet. Seb plans to offer a variety of feet/sled options — including round bases, plastic runners, and aluminum cone-style bases with spikes. In addition, at our request, Seb may experiment with large, cylindrical style feet, like those used on the Jennings chassis with integral bipod. 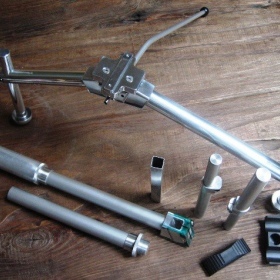 Seb’s joystick bipod is still in the prototype stage, so no price has been set yet. However, Seb hopes to have production versions available before the end of 2013. Perhaps a few pre-production units may be ready in time for the F-Class Worlds in Raton, NM in August. Share the post "Seb Unveils Lighter Yet Stronger GEN 2 Joystick Bipod"
“It’s a keeper” — that’s what Sam Hall, 4-time IBS 600-yard Shooter of the Year, told us after he test-drove the new SEB MAX coaxial front rest. Over the past two months, Sam has been testing the new SEB MAX with his competition benchrest rifles, with a variety of forearm widths from three inches to eight inches, and weights from 17 to 61 pounds. Did Sam like the SEB MAX? He did indeed — in fact he was so impressed with the MAX rest that he is selling his current front rest and he will be using the SEB MAX for both LG and HG matches. In designing the SEB MAX rest, Sebastian (“Seb”) Lambang set out to build a rest that would handle true heavy guns up to 45kg and also adapt to lighter rifles with a variety of forearm widths. This was quite a challenge, but he pulled it off. The SEB MAX quickly adapts to fit narrow, medium, and wide forearms, with a simple adjustment of the side plates on the three-piece front bag. You can change from 3″ to 5″ to 8″ width in seconds. If you prefer a conventional one-piece front sand-bag, SEB offers one-piece bags sized to fit various forearm widths from 2.5″ to 8″. The SEB MAX also adapts to different rifle weights through the use of a front counter-weight for the heavy big boomers. With a standard 17-lb Light Gun, you can run the MAX with no counterweight. The joystick control movement is very smooth and with the internal springs tuned right, you can shoot with your hand off the joystick. When you want to switch to a true Heavy Gun, simply attach the counterweight arm to the front of the gun. SEB can supply custom counter-weight “donuts” tuned to your specific Heavy Gun. Sam Hall reviews the features of the SEB MAX in the video below. Does the SEB MAX retain its smooth movement even with a true Heavy Gun on the front bags? Absolutely. Sam reports that “When shooting my 61-pounder, with the counter-weight in place, the joystick movement is smooth and predictable — it feels just like the Light Gun”. To prove how well the counter-balancer works with a true Heavy Gun, Sam put his 61-lb Maxi-Tracker on the SEB MAX, attached the appropriate counterweight, and then shot a group at 600 yards without touching the joystick during a four-shot string. To Sam’s amazement, the gun produced a 4-shot group under 1.5″. Sam says: “That was in mid-day with some mirage. That’s about the best this gun can do in those conditions. It was impressive to be able to run a string with a 61-pounder and not touch the joystick.” You can see this in the Part 2 Video below. Sam likes the modular construction of the SEB MAX. Sam found that, when he was just shooting a Light Gun, he could remove the rear foot, making the rest easier to move around. Like the SEB NEO rest, the MAX rest breaks down into flat modules so it packs more compactly for shipping. SEB MAX rests are currently in the final stages of production. Price for the USA market has not yet been set. You can get on the pre-order waiting list by contacting Ernie Bishop in Gillette, Wyoming. Call (307) 257-7431, or email ernieemily [at] yahoo.com. For other markets consult dealer list on www.SebCoax.com. Weight: The MAX weighs approximately 18.4 kg (40.5 lbs) without the counter-weight, with bags empty. Sam’s rest with full bags and counter-weight is about 45 pounds. Rest Size: Side to side footprint (center to center of leveling screws) is approximately 13.78″. Dimension from back to front is about 14.17″. Share the post "SEB MAX Coaxial Front Rest — Field Test by Sam Hall"
Our friend Sebastian Lambang, creator of the SEB Coaxial rests and the new SEB Joystick Bipod, recently visited Great Britain to participate in the European F-Class Championships. While in the UK, Seb visited the famous (infamous?) Diggle Range, as well as London Towne. Seb was hosted by Brit shooters Brian Fox and our buddy Vince Bottomley (who writes for the TargetShooter Magazine). After flying from Surabaya to Manchester airport, Brian Fox picked up my wife Lily and me on Oct. 26 morning. We then went straight to Diggle Hotel. Saturday I shot the 800-yard match at Diggle Range and Sunday I shot the 300m ‘Tactical’ Match. Monday to Wednesday morning Lily and I did sight-seeing in London. Then we went to Bisley by train. I got a little practice time on Thursday then shot the individual match on Friday and Saturday. The team match was on Sunday but I didn’t shoot it since a friend took us to his house. I think I didn’t do very well in the Europeans. Probably because this was my first-ever F-class match, and the temps were too low for me. I was told also that Bisley is hard to shoot, the wind flags pointing ‘everywhere’, and I wasn’t sure what I should I watch to judge the conditions. I can’t trust the wind-flags, I couldn’t see mirage most of the time to help to determine the hold off. However I really liked the Championship event and enjoyed the shooting. Congrats to Lee Tomlinson (F-Open Winner, 459.30), Tim Stewart (F-TR Winner, 439.23) and Great Britain’s victorious F-Open and F-TR teams. Vince Bottomley supplied a rifle for me to use at the Championships. Vince is a great guy indeed, he helped me with the rifle, the loads etc., and most of all he spent three full days with me while I was shooting the match. I can’t thank him enough. AccurateShooter: How did the new Joystick Bipod Work? AccurateShooter: When will the bipod go on sale? Is the design finalized? Seb: I still need to perfect the legs of the bipod, I think. I will probably make two models, one with compactness in mind and one other with the lightest legs possible. The MAX rest is in production currently, and then I’ll make another 200 NEO rests for the people on the waiting list. After that we could probably start bipod production. I do hope that the bipod can be ready for sale sometime in mid-2013. The first batch would be 100 units. If my prediction is correct, all 100 units will be sold or spoken for. AccurateShooter: How much will the production version of the Joystick Bipod cost? Seb: Still not sure, but it should be around $350-$400 in the USA. The most expensive part is the coaxial unit. According to Brian Fox, the bipod attracted a lot of attention/interest during the match and if I had a dozen units with me, we might have sold them all at the match. I really enjoyed my visit to the UK, especially visiting with Brian Fox (he is a great guy and genuine indeed!) and meeting fellow shooters from other European countries. I learned a bit from the F-class shoot and I think the bug has bitten me. It’s also nice to see a sea of SEB rests at the Bisley range in the F-Open Class. I send my thanks to all the people I met during my visit. It is great to make new friends, and I’m happy to be a part of this great group of shooters. 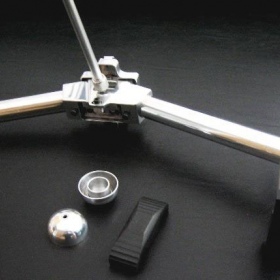 Share the post "Seb Does Diggle… and Bisley and London"
Sebastian (Seb) Lambang of SEB Coaxial, a brilliant designer and fabricator, has created an ingenious joystick bipod. The first coaxial bipod we’ve ever seen, Seb’s new bipod is a superb example of creative design and smart engineering. This unit gives F-TR and other bipod shooters precise, one-handed control of both windage and elevation. Seb’s innovative joystick bipod is yet one more example of the innovative, advanced engineering we’ve come to expect from his company. We think this guy could be building Formula 1 cars if he set his mind to it. We are fortunate that Seb loves shooting, so he applies his talent to designing and building great new products for the shooting sports. Seb will test and refine the design in the next couple of months before production starts. But Seb is quite satisfied with the design so far: “The rigidity, ease and comfort of use, and compactness, are already OK in my opinion.” Folks in Europe will be able to see the design very soon. The first real-world test of Seb’s new joystick bipod will be at the European F-Class Championship, slated for November 2-3 in the UK. Seb notes: “I won’t be shooting F-TR in the match, but I will ask some fellow F-TR shooters at the Bisley range to test it, and provide feedback.” Seb invites Daily Bulletin readers to look at the photos and provide comments or suggestions on design enhancements. At the lowest setting with the adjustable legs, the SEB bipod is approximately 6″ tall. At the highest setting, the unit is about 9″ tall. To smooth upward movement of the rifle, Seb designed the coaxial head with “built-in uplift”. The joystick itself is about 10″ long, with a collet-type head. When folded, the new SEB Bipod is relatively compact, about 9″ long x 5″ wide x 2″ thick. Most parts are made from aircraft grade 7000 series aluminum. 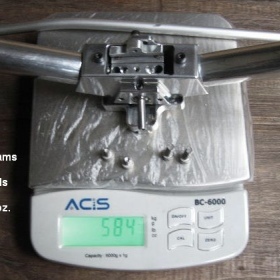 The current weight of the prototype is 26 ounces (740 grams). Seb is working on reducing weight for the production models. *True vertical travel is about 32 MOA but in the field the rifle stock will limit how far you can lift the joysticK. Note also that the adjustment range varies with your set-up geometry. The shorter the distance between the rear bag and the bipod, the greater the travel in MOA. This means that if you extend the distance between rear bag and bipod, you will lose some MOA travel. Share the post "World’s First Joystick-Controlled Bipod — NEW from SEB Coaxial"
Sebastian Lambang, creator of the original SEB Coaxial Rest and the SEB NEO Rest, has a new product in the works. Seb has modified and upgraded his superb NEO rest, so that it can handle heavy, long-range benchrest rifles with ultra-wide forearms. Seb calls his super-sized front rest the SEB “MAX”. As you can see in the photo below, the MAX looks like a NEO but with a wider stance and more substantial rest top. 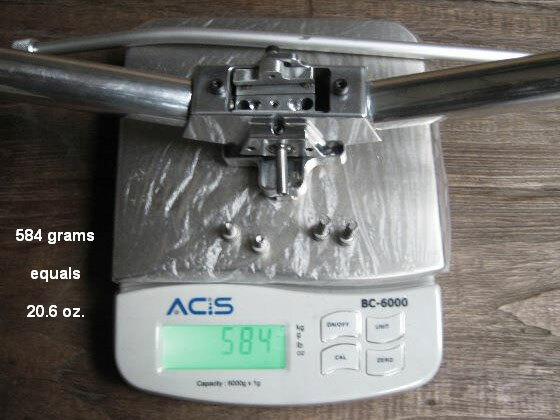 Spring rates are optimized to handle rifle weights up to 45kg (99 pounds), using appropriate counterweights. Seb hopes to complete production of fifty (50) SEB MAX rests by late August 2012. In this video, Aussie Stuart Elliot uses a prototype SEB MAX with his .300 Win Mag Heavy Gun at a 1K benchrest match in Brisbane, Australia. Stuart, who runs BRT Shooters Supply, recently won the Australian 500m Fly Shoot Nationals shooting a .300 Win Mag. Below is the standard SEB NEO rest. The MAX is wider and will hold a rig up to 45kg. The MAX represents an evolution of the original NEO design. As anyone who has had the pleasure of using one knows, the NEO is very smooth to operate and has a huge range of vertical and horizontal travel. In addition, the NEO can be quickly dis-assembled to store flat. The new SEB MAX can likewise be dis-assembled for easier storage and transport. Photo by R.J.Hamilton. Sebastian Lambang has a website at www.SebCoax.com, but you won’t find info on the SEB MAX there yet. If you have specific questions, send email to: sebastianlambang [at] yahoo.com. Share the post "New Ultra-Wide SEB MAX Front Joystick Rest Revealed"
You interested in a really wild, innovative bench gun that can shoot both short-range and long-range matches? Check out Seb Lambang’s latest “do-it-all” rifle. It’s a switch-barrel rifle combining two very different chamberings: 6 PPC and .284 Winchester. With that caliber combo, Seb’s covered from 100 yards (LV/HV mode) all the way out to 1000 (LR Light Gun mode). But the dual chambering is not the rifle’s only trick feature. Exploiting the new long-range benchrest rules, Seb has fitted a 3″-wide, flat rear metal keel to the buttstock. That counter-balances his 30″-long 7mm barrel, improves tracking, and adds stability. Seb built the stock and smithing was done by Australian gunsmith David Kerr. To further reduce torque and improve tracking, the stock features an 8″-wide, detachable fore-end fixture. This “hammerhead” fore-end section has extended “wings” on both sides, making the rifle super-stable. The hammerhead unit can be removed, leaving the stock 3″ wide for use in registered benchrest matches where 3″ is the maximum width. The photos below show Seb’s gun in .284 Win Long-Range (LR) Light Gun mode. Seb has already used his switch-caliber, switch-barrel rig successfully in competition. Seb tells us: “The gun shot and tracked real well either in 6 PPC LV/HV mode or in .284 Win LG mode. I love it! With this gun I placed Top 10 for the Two-Gun at the Harry Madden Championship in Brisbane, Australia just a few days ago and took the silver medal for the 500m Flyshoot with the .284 Win on the next day. So who says a switch-barrel rifle can’t (or doesn’t) work?” And get this, Seb finished the stock just four days before the Brisbane match. He glued-in the action the evening before the match and shot it the next day in competition. Pretty impressive we’d say…. Action: Stolle Panda Short Action (glue-in plus front/rear alum. pillars), Right Bolt, Right Port, Right Eject, .473 bolt face. LV/HV Weight: Rifle weighs 10.4 lbs in 6 PPC mode (no keel, no front wings). LV/HV Barrel: Krieger 21.5″ OAL, 6mm (6 PPC, .270″ neck), 1:14″ twist. Light Gun Weight: 15.5 lbs in .284 Mode with 3″ rear aluminum keel and 8″ fore-end attachment. Light Gun Barrel: Maddco 30″ OAL, 7mm (.284 Win, .316″ neck), 1:9″ twist. Metal: Home-made, one-piece scope base with +15 MOA scope rings. If you don’t know already, Seb Lambang is the designer/builder of the innovative SEB Coaxial rests. These are some of the best joystick rests on the market. The latest version, the SEB Neo Rest, is a brilliant design that folds flat for transport, yet offers extended vertical and horizontal travel and a rest top that can adjust from roughly 2″ wide to over 6″ in width. This Editor uses a SEB Neo for both bench and F-Class shooting and it is my favorite joystick rest. Rest in photos is a SEB Neo MAX. Share the post "Seb’s Wild 6 PPC + .284 Win Fat-Bottom Hammerhead Convertible"